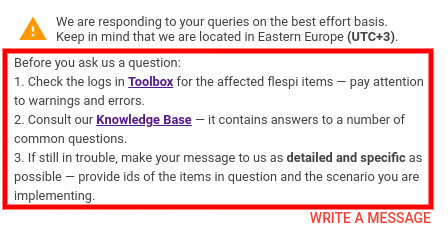 If you haven’t used the flespi support chat yet, you are either a king of self-education or are missing on a great opportunity to get concise responses fast. But this article is more than just a friendly reminder of an efficient support communication channel. The chat has evolved quite a bit since the initial release, so we will also tell about all the big and small things it has acquired by now. Until now the flespi support chat has been available only from the flespi panel. It’s changed. Flespi chat, aka HelpBox, can be opened in a separate browser tab at https://helpbox.flespi.io/. Or you can detach the HelpBox from the flespi panel and have it in a separate dialog. Even though integration into the flespi panel is one of the key advantages of our chat, we recognize that using it independently may be more convenient in some cases. E.g. 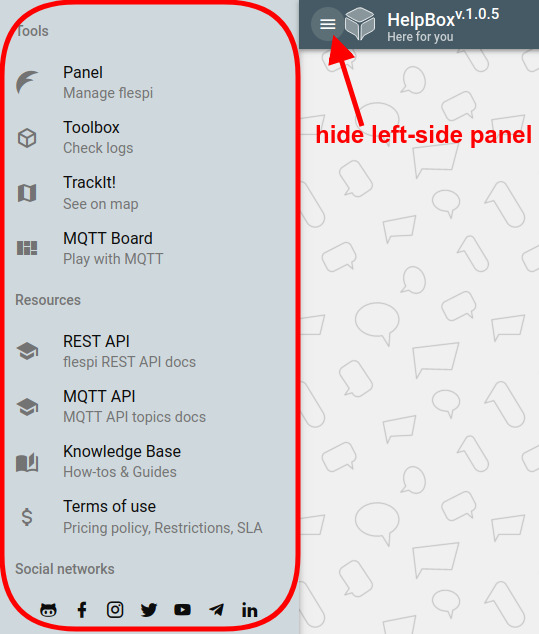 on the mobile to save traffic and decrease load time (by not loading the entire flespi panel) or on any device if you are working with flespi over API and do not normally have the panel open. BTW, you can create a HelpBox icon on your phone’s home screen for quicker access (you will be offered to do so upon your first visit to https://helpbox.flespi.io/ from a mobile device). We invest a lot of time and efforts in creating the resources that can help you along the way. That is why we ask you to follow a short checklist before you start writing a question — a lot of them can be prevented by adhering to the steps we advise you to take. This was a highly anticipated feature — and now we have it. You can share any files that may facilitate your issue resolution — screenshots, logs, code samples, screen captures, etc. You’ll find a familiar clip icon at the right part of the text box. Then by clicking on the plus icon, you can add one or several files. When done, click the send icon to dispatch all the attachments. Only available when HelpBox opens in a separate tab. 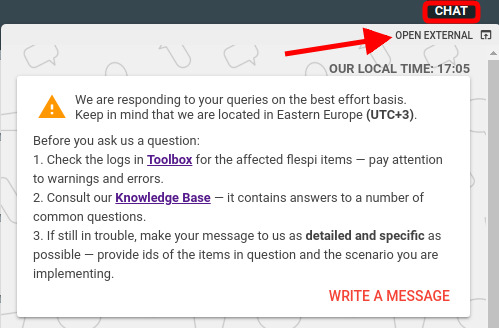 We have allocated helpful links to flespi tools and resources in the left-side panel. Access our products and accompanying documentation as well as all of our social media accounts in one click. Hide the panel anytime to free space on the screen. We don’t stop on the way of making your communication with us effortless, efficient, and flexible. The new generation of our support chat — HelpBox — becomes independent of the flespi panel and full of nice extras. UPD: you can now use HelpBox bot to chat with us from the Telegram interface. We are fighting fiercely against the feature overdose and carefully consider each new request. Hope you find our picks handy when chatting with us. Let us know if there's anything we can do to improve the usability.